This high speed Economic Recovery Project widened US-189 to 5 lanes with over 260,000 cubic yars of excavation. This is a high volume roadway with no alternate routes, so traffic had to be maintained and planned for throughout the project. Rocky Mountain Power and Qwest utility relocations had to be coordinated to avoid impact to the production of the project. This project had a high environmental commitment due to the close proximity to Deer Creek Reservoir. All environmental checks and traffic controls checks performed by UDOT showed an exceptional rating. 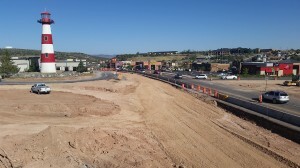 This project was awarded the Highway Project of the Year (under $10 M) award from the AGC of Utah.